National Rural Mental Health Forum members celebrate International Women’s Day at a recent meeting of the Forum. We were thrilled to share our partnership work to improve rural mental health with the Minister for Mental Health Clare Haughey MSP, during a visit to King’s Building last month. SRUC staff and partners came together to highlight how we work together to enhance wellbeing, support students and staff, and carry out research on mental health that’s already having an impact. SRUC is a founder member of the National Rural Mental Health Forum. Funded by the Scottish Government, it’s grown from 17 to 70+ members in just over two years. This is incredible and shows just how much this forum is needed. The National Rural Mental Health Forum Convener, Jim Hume, showed how the Forum uniquely brings together rural networks and services – including farm support, forestry, vets – alongside mental health charities, churches and befrienders, plus Scottish Government departments and agencies. Expertise is shared on how to reduce stigma around “It’s OK not to be OK” - particularly tough in small rural communities - and how to improve support. You can support the National Rural Mental Health Forum by following them on social media and sharing their campaigns. SRUCSA has been leading the way through “Shady the Dog”, our mental health mascot who has been reducing stigma, raising awareness and promoting support for students no matter where they are across our campus network. Former SRUCSA President Gemma Jones and now community worker for Support in Mind Scotland in the Western Isles inspired us all with her own journey and support for many hundreds of students. David Collins and Lizzie Lundy from SRUC HR also brought to life their really important work ensuring staff have spaces to talk and be listened to, Mental Health First Aid Training, and integrating mental wellbeing into wider health and nutrition through “Destination Wellbeing”. So what did the Minister think of her visit? Almost a million people live in rural Scotland. Through our consultancy services, research networks, provision to students, and the fact that many staff live across Scotland’s islands, highlands, remote lowlands and other “nooks and crannies”, we have incredible rural reach. 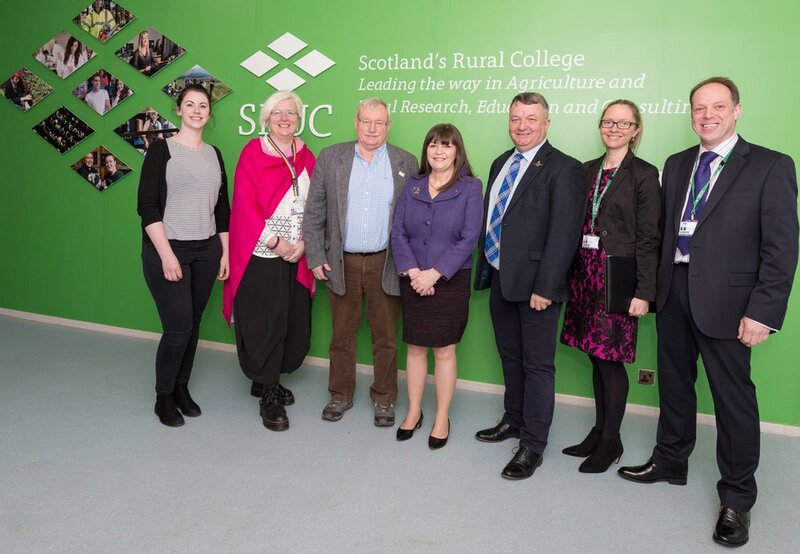 Thanks to our networks across Scotland, SRUC has not just an opportunity but also a duty to promote mental health and wellbeing both internally, and to all our partners and stakeholders. If you would like to get involved, please do drop me a line - thanks. This is a crucial consultation on Attendance Allowance and the Scottish Government are particularly interested in hearing from those in rural areas. Attendance Allowance helps with extra costs if you have a disability severe enough that you need someone to help look after you. By completing the survey, the information you provide will help the Scottish Government make decisions about how to make Attendance Allowance work better in Scotland. Mental Health Minister Clare Haughey hailed Scotland’s National Rural Mental Health Forum as “a platform for change” at a successful Parliamentary Reception. The Holyrood reception on 2 October was hosted by Gail Ross MSP and aimed to raise awareness of mental health issues in rural Scotland as well as giving Forum members a chance to meet and make connections.